MICK JENKINS SHARES NEW SINGLE "SPREAD LOVE"
Red Bull Sound Select has announced that they're presenting a North American tour with Chicago rapper Mick Jenkins, and up and coming St. Louis rapper Smino, including a stop in Toronto on Tuesday, October 18 at Adelaide Hall. Tickets for Red Bull Sound Select Presents: A Quest For Love are available today for $3 with RSVP at www.redbullsoundselect.com. Mick Jenkins has also announced the release date for his debut album and shared the first single from the project with "Spread Love". After two critically acclaimed projects under his belt with 2014's The Water[s] and 2015's Wave[s], Mick is back this year with his strongest artistic statement to date with The Healing Component. The Healing Component is a reference to love being the quintessential healing component and love being able to heal all. The Healing Component will arrive on September 23rd via Mick's Free Nation label. Mick Jenkins says of the tour and its title, "Just trying to see how much love is out there in the world in a time where we need it the most. It's so easy to hate, have a negative opinion. I want to actively talk about love- what it is, what it means to people, what it looks like and in just mere conversation that energy might be transferred. But with the music, that is precisely what we aim to do." 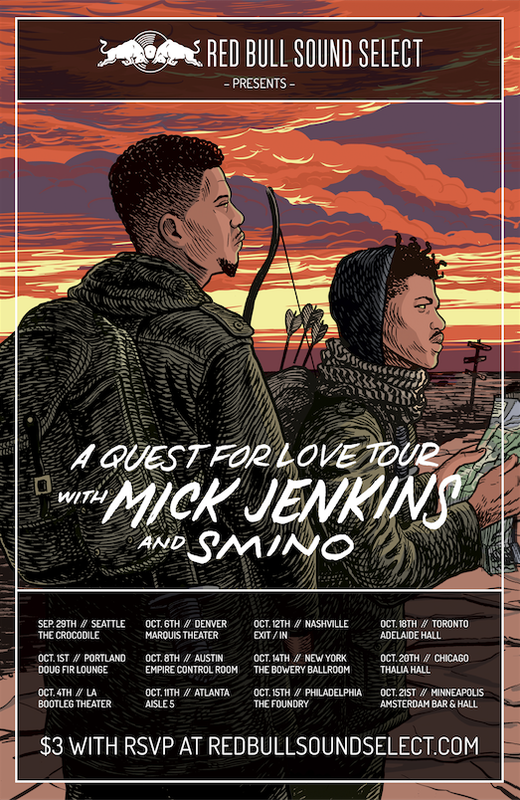 Fellow Midwest MC Smino, a young rapper from St. Louis will join Jenkins on the tour. Smino has been making waves with his Zero Fatigue crew and his work with 20 year-old Soulection producer Monte Booker. Red Bull Sound Select Presents: A Quest For Love Tour will hit all of the North American cities that Red Bull Sound Select, an artist development program, has been holding events in annually since the program's inception in 2013. Check out the new single "Spread Love" above and find full tour information for both Red Bull Sound Select Presents: A Quest For Love Tour and Mick's European tour below.